Hopefully you've read through the posts and followed along. A few final thoughts on a fantastic trip! First...a thank you again to a few helpful and friendly members of the Texas BBQ Posse for earlier research, advice and tips on scheduling, and a general overview of the best of the best. 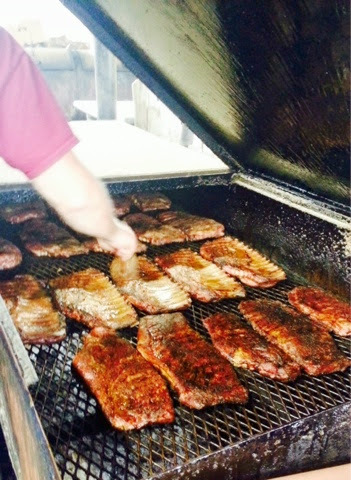 We learned that personally we have a way to go on perfecting our own brisket! We also learned that we feel we could stand in line and compete with this collection of rib smokers. And we learned that we need to start making and smoking sausage!! It was all fantastic. Are "expected" to be fantastic, and there was not a place on the list that disappointed us! Super sausage and it's a signature style thing not really meant to compete head to head. 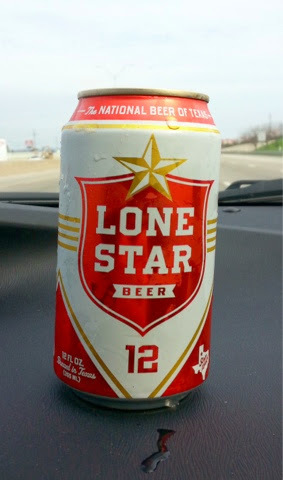 So thank you Texas, for an awesome welcome,mand awesome BBQ Tour! 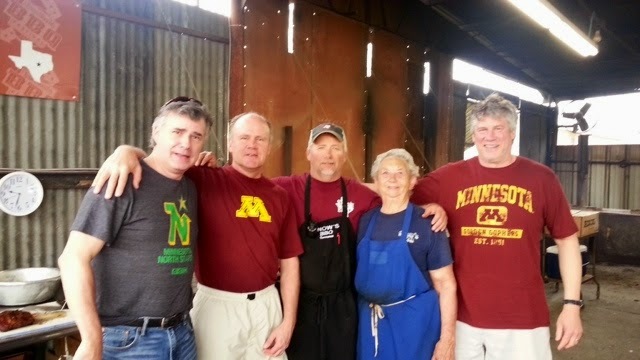 The Minnesota Golden Gopher BBQ Posse! 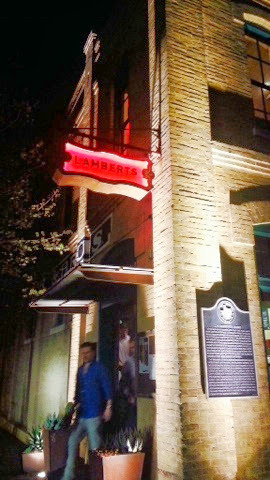 A fine evening of cocktails and people watching back in town after a day on the road to Lockhart and beyond, and the Garrison Bros Distillary tour....we tried something a little different at the West end establishment of Lamberts. Known for its professional quality beef ribs, ribs and brisket...we decide to switch it up and try some smoked chicken and Lamberts sausage. 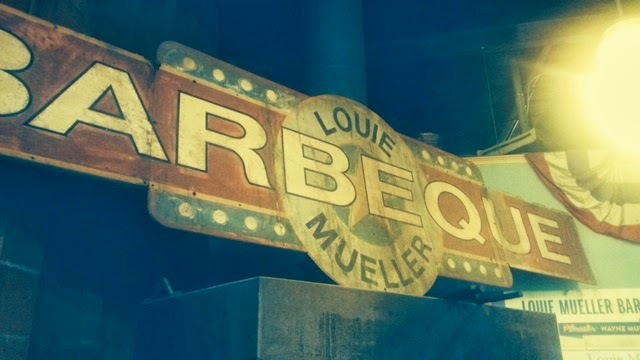 All we can say....is another awesome experience, mood, drinks, and smoked meat. 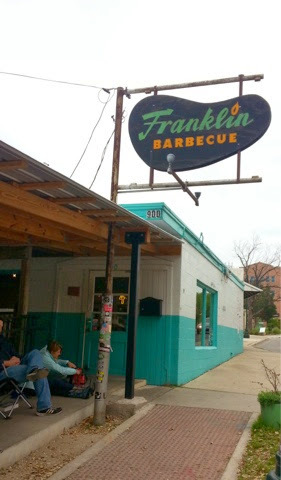 But it was up early the next morning to face the madness at Franklins with a plan to also get to La Barbecue, and maybe even over the black sheep of John Muellers Meats. Our intentions were noble. We got in line at Franklins at 8:40 am and conned our queue mates into a couple of bloody Mary's and prepared to wait it out. After an hour or so...the pre-order Steward made her way down to our end of the parking lot and promptly informed us that we could expect to get served between 1:30 and 2:00. Between hunger, impatience, and some might say a modicum of common sense....we decided a 5 1/2 hour wait for yet ANOTHER plate of smoked meat was not in our cards. Apologies to Aaron Franklin and a well understood and well deserved reputation for awesome Q I'm sure...but we packed up and made our way to La Barbecue. Sorry Franklins. It's only meat after all. The ribs of course were everything one could expect. We loved em! The brisket was incredibly moist, flavorful, colored and a medium crusty bark. It's hard to compare or contrast one master to another. We loved it all...but there was one consensus opinion about it all...the "perfect kiss of smoke" we felt was missing. 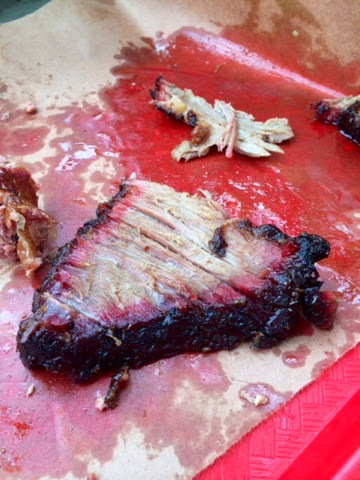 The smoke ring was perfect in the brisket....but the smoke flavor was hiding somewhere. Nothing not to like, nothing bad to say...just our observation. It must have been a busy Sunday...because by the time we found John Muellers, he was sold out. Drifted over to Mickelthwait's for sausage and they too were left only with pulled pork. We sought out a small trailer back downtown called Valentina's for some savory yummy brisket tacos and called it an awesome day. 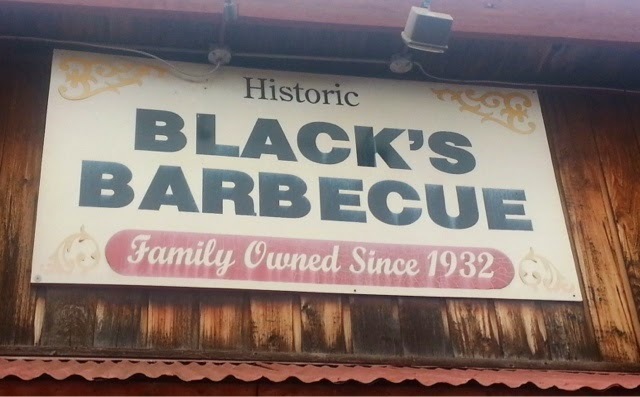 Lockhart TX has a reputation as a destination Texas Hill Country barbecue spot and rightfully so. Even a Minnesota foodie like myself has run across the name of Kreuz market now and again. Coupled with Smitty's and Black's, Lockhart was a must see town on the tour. See....being the operative word. We chose Black's to hit first based on reading, reputation, and ambiance. 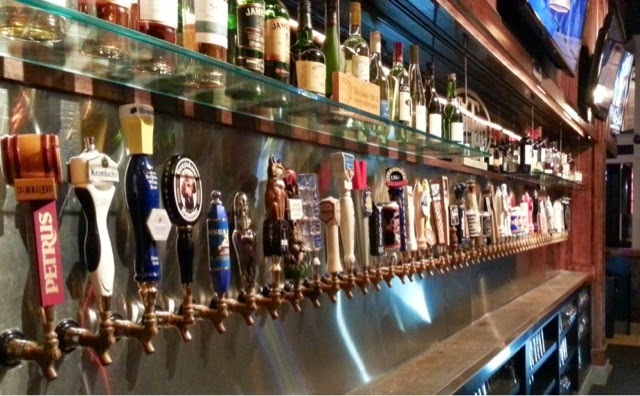 We went back to brisket and sausage, and saw the bar get moved up just a bit yet again. 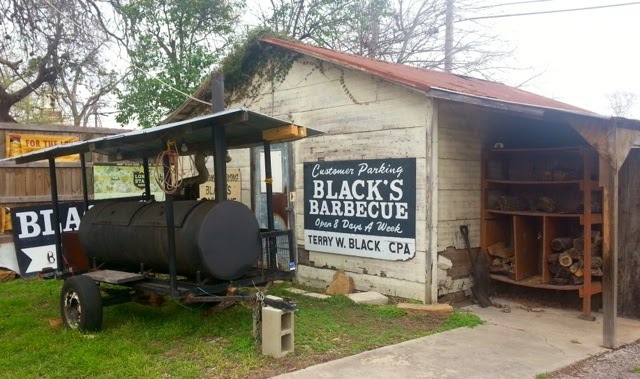 Comparing one of these top 10 Texas BBQ spots is really hard! And certainly there are a lot of factors. 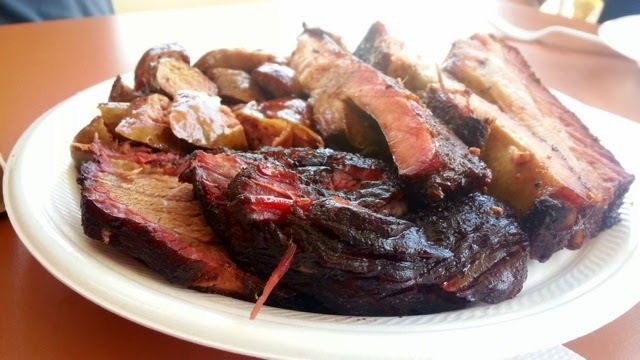 But the perfect black bark...the perfect pink smoke ring, and the perfect moist tender savory brisket inside was just eye popping lay beautiful, and incredible to savor. We were feeling a little weird clicking pics of all this meat wherever we go...but this was a photo op we had to share. THIS is the appearance we were looking for...being professionals or not...it's what we expected coming to Texas, and we found it. Incredible brisket...no sauce, no mess, just mouth watering beef bewilderment! The sausage on the other hand while flavorful, smokey and delicious....had a distinct level of fat or grease that was too hard on the palate. We all three felt although it tasted good, after a few bites the mouth sort of rejected it as too rich, greasy, or fatty. 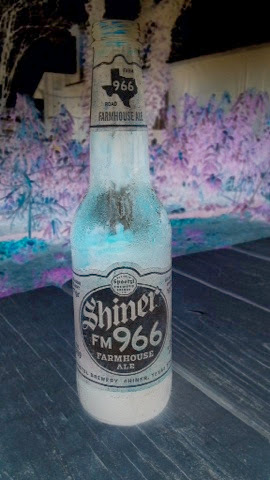 Sitting in the side yard at a picnic table though, sharing a great in house beer selection and a Texas Spring day, and another awesome smoked brisket at a historic smokehouse was all pure joy. This was the days 3rd stop for meat, and we were feeling taxed! 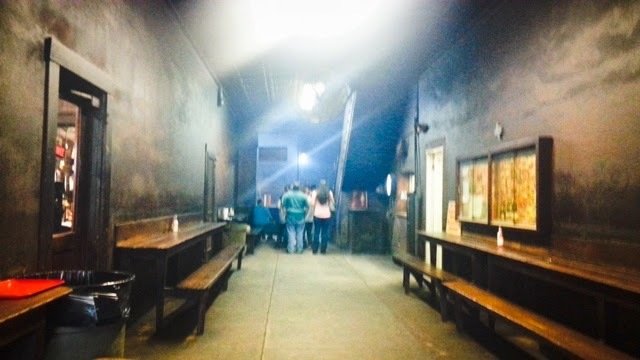 We had to see the historic open fire brick pits at the classic Smitty Smokehouse, but between the long lines, and our full bellies we deferred both Smittys and Kreuz to another return trip some day. No disrespect or diminishing expectations of course...but time and physical abilities were limited! 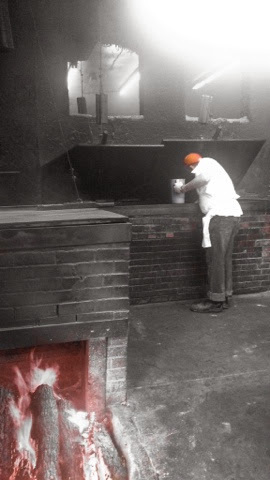 :) but see the bottom photos of the cool historic look, smell, and feel of Smitty's. Saying goodbye to Tootsie at Snows, she and Kerry both suggested the monster Texas beef ribs at Louie Muellers in Taylor TX. So advice taken...and well advised! 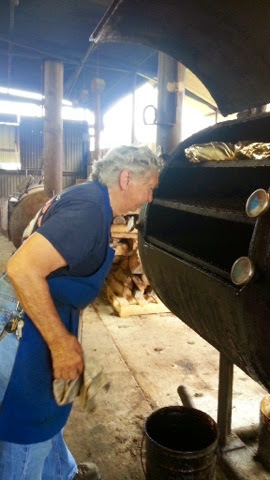 The sleepy town of Taylor houses a great old classic smokehouse and some true artisan pit tending. 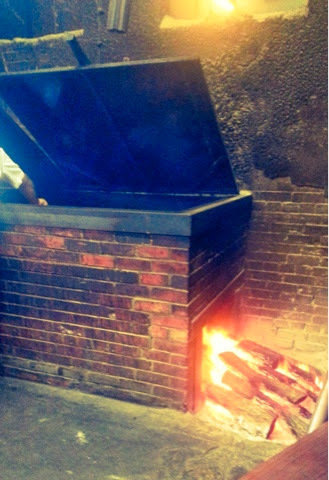 No pit thermometers here...just know when the meat is ready! 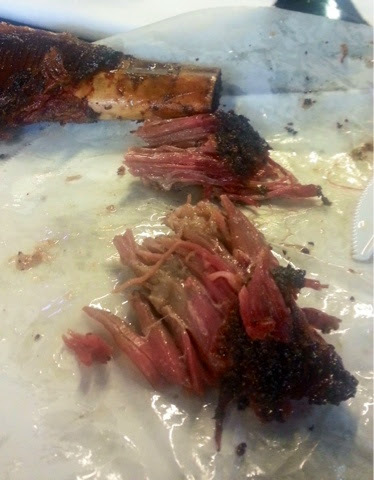 We decided to skip another brisket, although it looked awesome....and try the huge beef ribs. They are not offered everywhere and we were eager for one. One. We split a mid sized rib which weighed in almost at a pound and a quarter...throw in some smoked chipotle sausage and we had another pile of beast to face down. Judiciously trying to get better at pacing ourselves through the day, and managing stomach real estate. The beef rib was incredible. A huge tough often fatty piece of beef to master, but this came off like a perfectly bark crusted, pink smoke ringed, moist and tender brisket on a bone! Meaty, moist, smokey, barked, and simply mouth watering without question. The sausage was another sample of really good savory and mildly spicy grind. Either we aren't schooled enough to come up with much bad to say about these sausage makers, or they all know what the hell they are doing. We are convinced it's the latter. All in all a great addition to the original plan, and easy to add on to a trip to Snows. 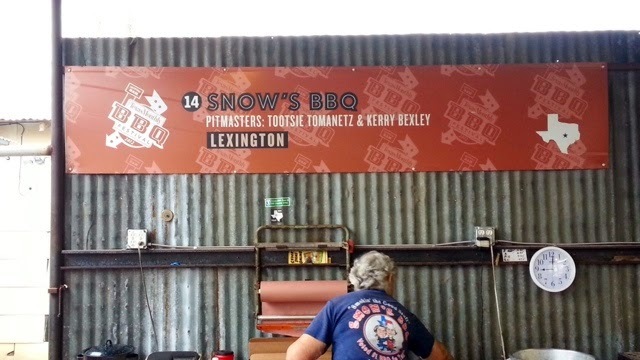 We heard unanimously in our research, that you can't take a Texas BBQ tour and not get to Snows BBQ in Lexington. An hour outside Austin is a true gem. 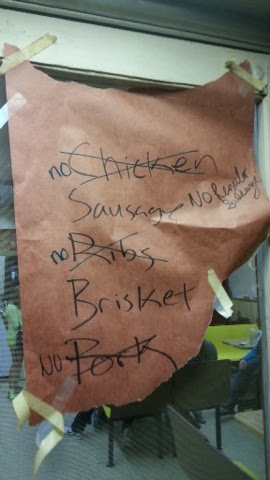 Snows is ONLY open Saturdays, opens at 10 am, and the brisket could be gone by noon or 1pm on a weekend! 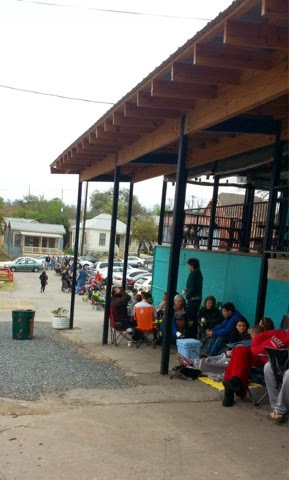 People leave Austin, and elsewhere at 7am and get in line for hours sometimes just to ensure they get some of the best brisket Texas has to offer. So we did too!! And we were not at all disappointed. It immediately became Matts favorite. A simple, friendly, open air pit place. Pit masters Tootsie and Kerry welcomed anyone with open arms, and were generous in telling secrets, showing the pits, and talking smart smoke. We loved them! The brisket was perfectly tender. 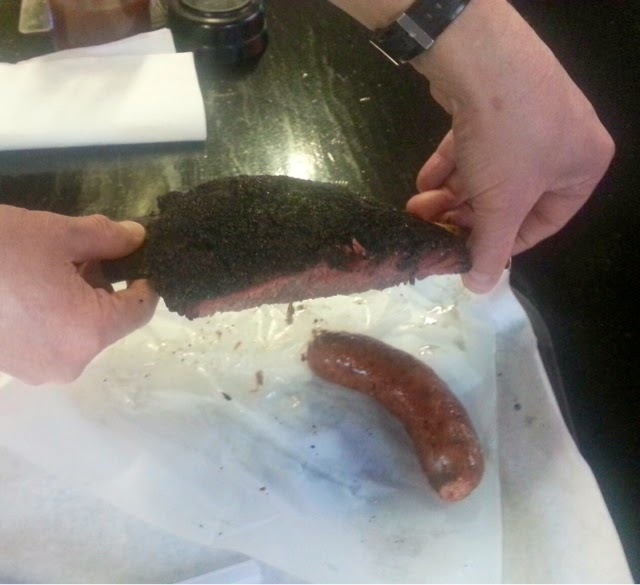 An awesome pink smoke ring and that Texas post oak smoke flavor from a real fire. It was truly wonderful. Mike and I are a dark bark loving team, and their style is not focused on a crusty bark. Matt is still talking about Snows brisket. The sausage became a quick favorite as well. Everything about it was excellent! A coarse grind, savory spicing, an edible perfectly crispy not chewy casing. The grind and no greasy feel and taste made it a top shelf choice! 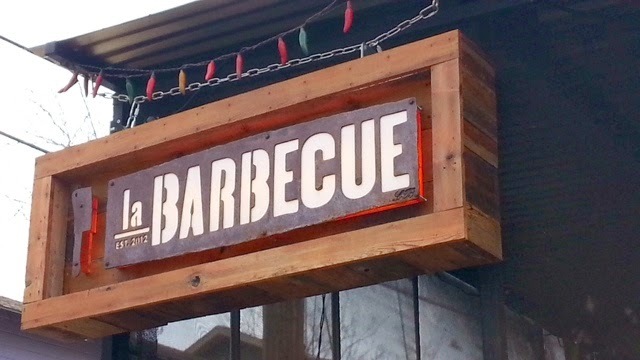 Overall, the vibe, the hosts, and the meat make the trip essential for any BBQ purists. 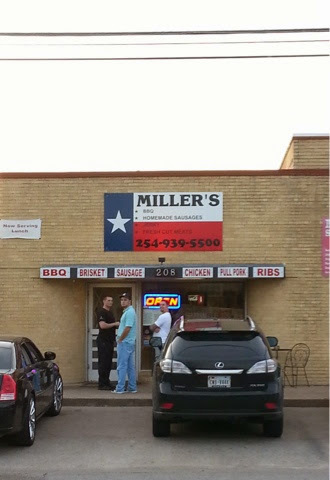 After leaving Millers Smokehouse we took a cab down down to a classic old brick bar for yes...more brisket, sausage, and ribs! 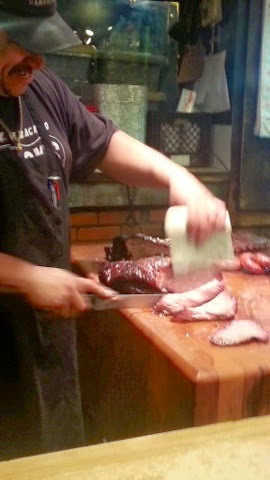 Although not on the classic infamous Smokehouse circuit in and around Austin, we were seriously impressed. In a short summary...we all felt the ribs were excellent. Moist, pleasantly rubbed, meaty and tender...perfect on the bone. And slightly smaller than the monsters at Millers. The house sausage was a little overpowered by a bit too much black pepper. A much coarser grind than Millers, and a bit drier. Good flavor, good smoke, but too much black pepper. The brisket was the best surprise. Gorgeously crusted with a tasty savory black bark, and tender, moist, and kissed with nice oak smoke. 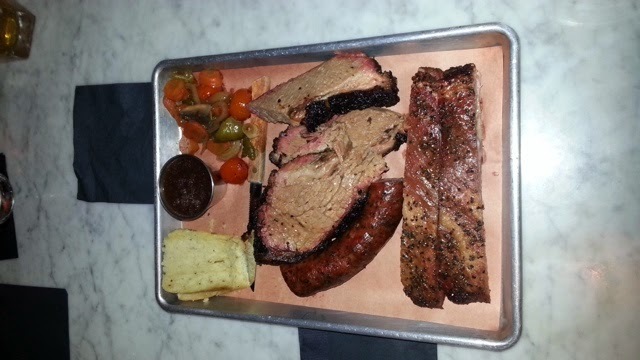 Maybe a generous late nite portion, but there was easily enough brisket for the three of us on this sampler platter! 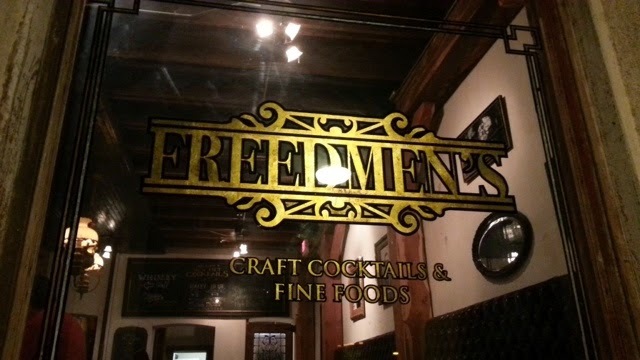 Coupled with the Whiskey of the Month, $5 Makers 46, we found Freedmen's to be the perfect late nite stop for a night cap of Texas Barbecue! 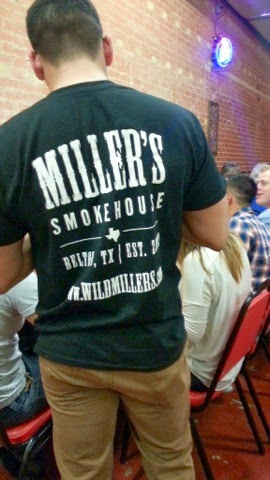 So we pulled into Millers Smokehouse in Belton Texas for our virgin ribs, brisket, and sausage experience on the BBQ Tour. We knew we had another stop later, but were overwhelmed with the need to eat! We got the last rack of ribs of the day, thanks to Dustin Miller sneaking back behind his Dad Dirk to save the last rack as we arrived. A rack turned out to be about 4 pounds of meat! The largest meatiest pork ribs we have ever seen! Bones the size of a small child's forearm. Meaty, moist and kissed PERFECTLY with smoke. A mellow nice rub,served dry no sauce as they should and they were FANTASTIC. The jalepeno smoked sausage was next. Again perfect! Smooth grind, nice kick, not spicy, and very savory and smokey. A solid win. The brisket, albeit our first to try on the Tour...was a little disappointing. Was moist enough, not dry...flavorful, but not really smokey. Admittedly, we all like a little more "bark" on our brisket, and this was lacking. Some of the flavor was missing, and the smoke was hard to detect. 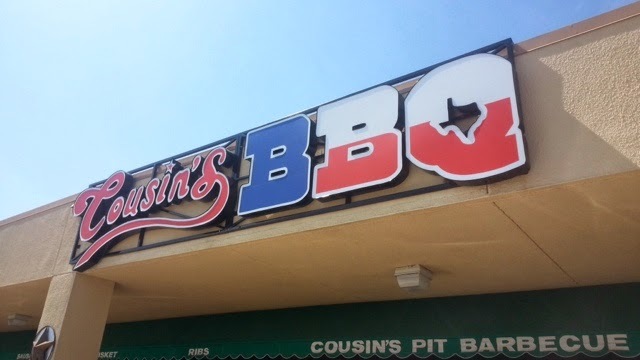 With two home runs on ribs and sausage, we still left pleased and would highly recommend a visit! The family was fun, friendly, generous, and great hosts. 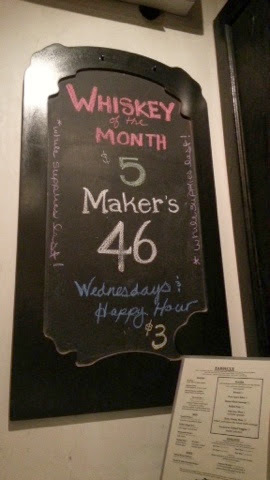 The vibe and atmosphere of live music was welcome, and a sampling of a local Waco phenom Balcones Brimstone Whiskey made for a perfect virgin visit. We left with tshirts and a lot lighter in the wallet!? Not at all disappointed. 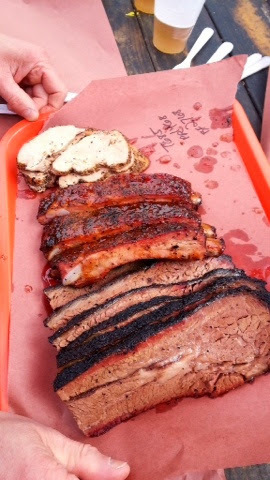 Tomorrow, Friday March 21st, Matt Abbott and Mike Cournoyer and I are taking off for a four day Texas Barbecue Brisket and Ribs personal tour! Mike and I have fancied ourselves as qualified backyard pitmasters for a few years now tackling ribs, smoked pulled pork, even the challenging beef brisket, among other smoked and grilled fare. But as anyone in Texas will point out, and they like to do that, you have not had smoked barbecue until you've been to Texas! 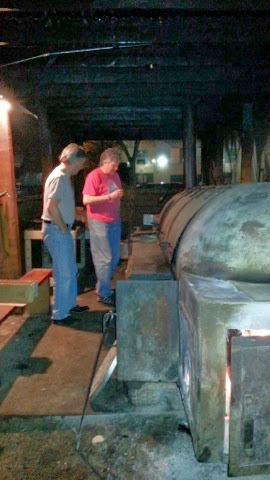 And with Franklins Barbecue getting hot national press in Food and Wine, Bon Apetite and more...we had to see for ourselves. Well a little research led to a lot of research! We even discovered the Texas BBQ Posse!!! 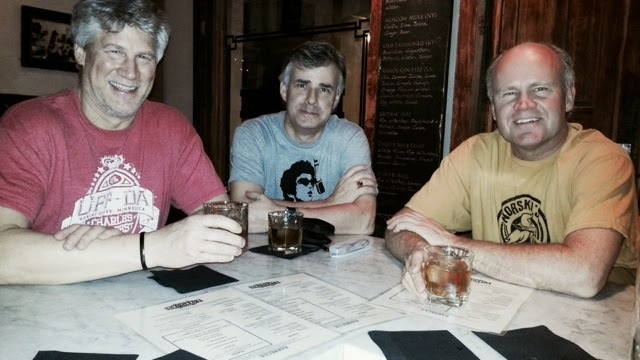 With the help of former fellow Minnesotan Gary Jacobson, and his fellow Texas Posse member friends...they steered us to more and more information, reviews, maps, and commentary on the BEST that Texas barbecue has to offer. 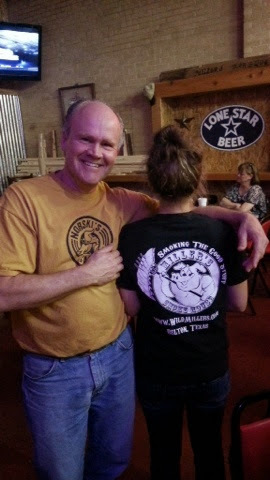 See their blog at http://texasbbqposse.blogspot.com Its amazing!! 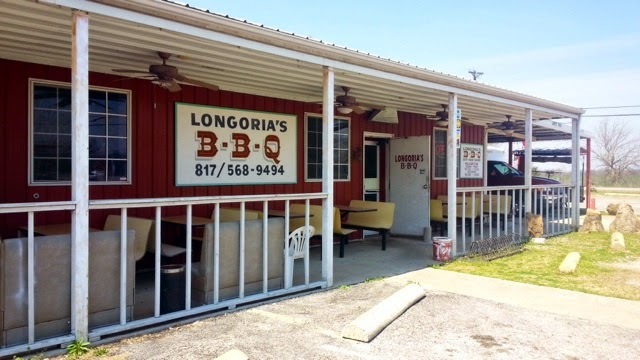 Together with advice from the Posse, a bunch of personal research, and the fine folks at Texas Monthly Magazine with their huge review of the Best BBQ in Texas....we have a plan that will make any grown man moo. 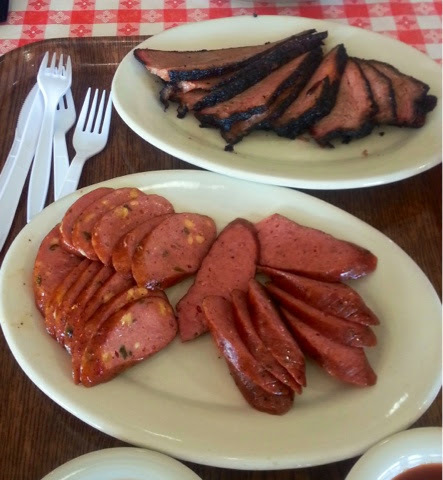 Of course our eyes and stomachs, and eager appetites are probably outsized to begin with, but we have a plan to hit some of the finest Pitmasters in Texas for a taste test and comparison of ribs, brisket, and the famous smoked sausage of Texas. 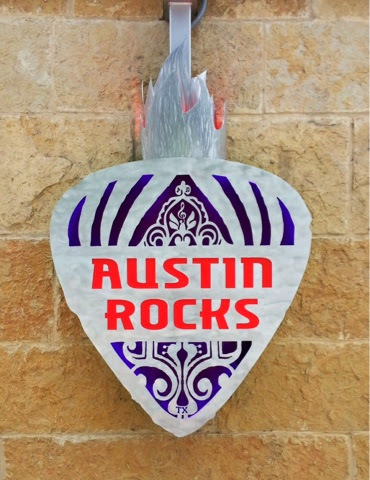 Most of these joints are centered around Austin, Lockhart, and Lexington, Texas. Our plan is to fly into Dallas on Friday night, pick up a car and head south! Watch and check back for live updates! Feel free to add comments, contact us, or add your two cents worth. 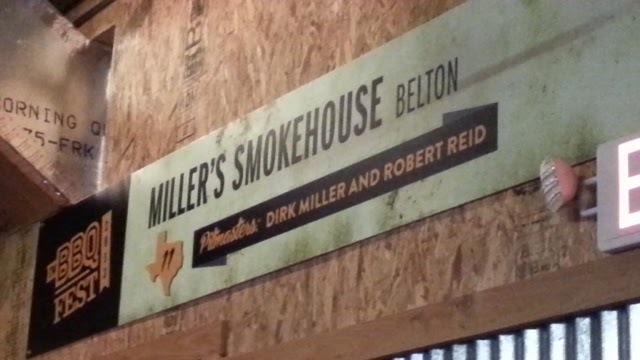 But for now...we are the Minnesota Golden Gopher BBQ Posse coming to see what Texas has to offer! !